It is relatively easy to get worked up by reading or watching the news (the perspective of the Nation State) and to find yourself siding with politicians publicly seeking endorsement of popular policies, perhaps a little more attention should be paid to the un-seen implications of these policies. I resonate with the passion from within which these emotions arise, and I am aware that we all want the same outcome (Peace); therefore I’m going to take the time to put in writing, the proof, that the best possible way to organize ourselves would be through the medium of reason and for this very reason today I shall address an un-seen monopoly, the monopoly on violence. “Lay down your arms!“. It is a pretty common statement; we have all heard it, now let us analyze it. When one calls out ‘lay your arms down’, what exactly is being inferred? Is the caller referring to all of humanity or just the slave class (Citizen/Slave: One who does not have the right of ownership to his/her product of labor) of a specific nation state not including the ruling class (Politician/Legislator/Master/Ruler: One who not only has the right of ownership to his/her labor but also that of his/her slave/citizen)? If the call is just (Justice: agreeable to ALL individuals because it is inherently fair to all parties involved), it has to apply to all humans; how then will the one who writes this legislation enforce it upon those who disobey? The only possible way to enforce such a rule is by keeping his/her gun and using it for enforcement, as those who disobey will obviously be armed. Therefore, logic dictates, that the one who legislates (the ruling class/slave-master) has to keep his/her arm for enforcement purposes or risk being ignored into irrelevance. The Slave-Owner (Government) can’t simply walk up to an armed human and claim authority over him/her. This will, more than likely, result in someone getting shot. If ‘lay your arms down’ refers to one group of individuals being granted “special rights” to be armed even if it is solely to “protect” other individuals, then the call is not for a just disarmament of the human populace as claimed, it is simply endorsing an unjust arms monopoly directly responsible for the monopoly on violence. However, if instead the call is for a complete disarmament of all humans in a Nation State (America, EU, USSR, China etc. ), what happens when a foreign nation state agent walks over with a gun? How would a disarmed local (Ruler or Slave) defend himself/herself against a threat of armed violence? Call a third party with a gun? The whole nation has no guns! Though it may not be obvious, despite the numerous “debates” the ontology of the above statement conjures up, the moment one dwells into the epistemology of that statement the inevitable becomes apparent. Why don’t we start with an axiom and take it from there. The statement, ‘lay your arms down’, might appear valid but the logic is flawed. Allow me to prove it. Politics/Socialism is a method, based on ignorance, to organize humans manipulatively and/or coercively in a hierarchical manner. It usually consists of one or more individuals forming a central authoritative collective that proclaims the right of ownership and distribution of resources by political means usually by way of force due to self granted monopoly privilege over others. This illegitimate method creates a clear class separation of humans, the superior (ruler) and the inferior (slave). The one who writes the “law”, and the one who has to obey it (usually the one who writes the law is not subject to it as it only applies to the slave class of humans). ie. all forms of Socialism from Communism, Fascism, Democracy, Socialist Democracy, Republic, Libertarian Republic, Liberal Republic, USA, EU, SINGAPORE, INDIA, CHINA, PAKISTAN, LIBYA, ISIS, nation, country, government, state, Church, Mosque, Temple to any AND all political collectives that claims to be “the law“. Anarchism is a method, based on economic laws, to organize humans amicably in a non-hierarchical manner. No Ruler. 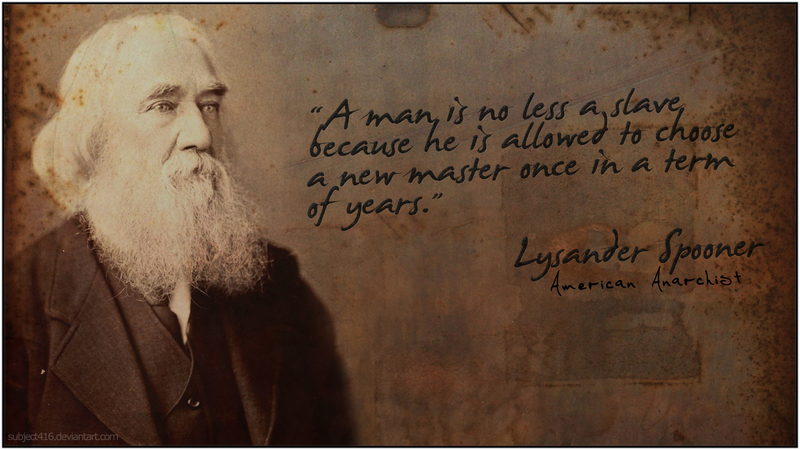 No Slave-Master. No politician to “protect” and/or rob you. No ruler does not imply no rules, au contraire; it implies that the rule is one for all individuals without exception. Capitalism is a method, based on economic laws, to organize humans amicably. It recognizes ownership of Person and Property acquired by Economic means NOT Political means, and the sovereign rights to freedom of trade. There are only two ways to acquire property, the economic means and the diametrically opposed political means. ie. trade (economics) or plunder (politics). Economics is the science of human interaction based on the science of justice. Economic laws are established only via precise observation upheld by proof obtained by means of investigation. It is economic law (rules), all proven without exception, that govern the interactions between consenting individuals in the market-place (Society). Rules (economic laws) govern Society (market-place). Note: The most accurate field of study presently would be Praxeology, the study of human action; with reference to Natural Law. The market-place is an organization or collective of human beings that consists of two or more individuals. Economic laws only apply when one individual (the self) interfaces with an other person. No one has the legitimate authority to knowingly or unknowingly initiate aggression against an other person/property, that would be politics – which is diametrically opposed to economics. Politics and economics are mutually exclusive. Afterall, there are but two means to any end. Trade it or take it by force and when one understands that “the law” is nothing more than the just use of force, things become much clearer. Unjust acts carried out under the pretext of “the law” do not magically make them just. No number of rituals (voting/political process/due process) changes that logic, unless words on a paper written by an “elected leader” somehow has more rights than your words on paper in which case you admit to being an inferior human in comparison to the one who is able to legislate. That is the myth of Statism, the myth of authority. And this myth is the root cause for the monopoly on violence. You may either agree or disagree, but logic dictates that only Statist systems can be implemented. Voluntary systems can’t be implemented, they are adopted. If this seems a rigid binary approach to “complex” subject matters, bear in mind what appears complex to you may not necessarily appear complex to another, especially to one who is able to perceive duality in all. These terms are not complex; they are made to appear so by socialist material. Most of the misunderstanding lies in the definition of the word ‘Law’. Define it in one sentence and you will see it clearly. What is the law, if not the just use of force? Think about it, there is no other logical definition. Law is force, the just use of it. And force, in this context, becomes relevant only when it is applied to person or property. So when can force be used on a person or property? Anytime a Statist-ruler (Government) claims it is just to do so? Anytime a person with a state issued magic badge pulls out a gun and stops you on the highway for driving 2 km/ph over the “speed limit”? Anytime the Statist-ruler feels offended by someone pointing out his/her idiocy? When then can force be used in a just manner? For that to be understood we have to first understand ‘person & property’. 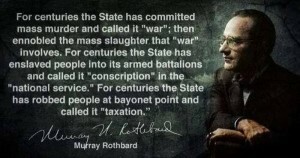 As Rothbard so clearly penned it, much is heard these days of the distinction between human rights and property rights, and many who claim to champion the one turn with scorn upon any defender of the other. They fail to see that property rights, far from being in conflict, are in fact the most basic of all human rights. The human right of every man to his own life implies the right to find and transform resources: to produce that which sustains and advances life. That product is a man’s property. That is why property rights are foremost among human rights and why any loss of one endangers the others. For example, how can the human right of freedom of the press be preserved if the government owns all the newsprint and has the power to decide who may use it and how much? The human right of a free press depends on the human right of private property in newsprint and in the other essentials for newspaper production. In short, there is no conflict of rights here because property rights are themselves human rights. What is more, human rights are also property rights! The self is your first property! There are several aspects of this important truth. In the first place, each individual, according to our understanding of the natural order of things, is the owner of himself, the ruler of his own person (body). Preservation of this self-ownership is essential for the proper development and well-being of man. The human rights of the person are, in effect, recognition of each man’s inalienable property right over his own being; and from this property right stems his right to the material goods that he has produced. A man’s right to personal freedom, then, is his property right in himself. But there is another sense in which human rights are really property rights, a sense which is much obscured in our time. Take, for example, the human right of freedom of assembly. Suppose that a certain group wants to demonstrate for a particular idea or bill in a street meeting. This is an expression of the right of assembly. On the other hand, suppose that the police break up the meeting on the ground that traffic is being disrupted. Now, it is not sufficient simply to say that the right of assembly has been abridged by the police for political reasons. Possibly, this was the case. But there is a real problem here, for maybe traffic was disrupted. In that case, how is one to decide between the human right of free assembly and the “public policy” or “public good” of clear and unobstructed traffic? In the face of this apparent conflict, many people conclude that rights must be relative rather than absolute and have to be curbed sometimes for the common good. But the real problem here is that the government owns the streets, which means that they are in a virtual state of no-ownership. This causes not only traffic jams, but also confusion and conflict over who should use the streets at any given time. The taxpayers? In the last analysis, we are all taxpayers. Should the taxpayers who want to demonstrate be allowed to use the street for that purpose at the time they choose, or should it be reserved for use by other groups of taxpayers as motorists or pedestrians? Who is to decide? Only government can decide; and whatever it does, its decision is bound to be a wholly arbitrary one that can only aggravate, and never resolve, the conflict between the opposed forces. Consider, however, a situation where the streets are owned by private individuals. In this case, we see clearly that the whole question is one of property rights. If Jones owns a street and the ‘Citizens United’ want to use it for a demonstration, they may offer to hire the street for that purpose. Then it is up to Jones to decide whether he will rent it out and at what price he will agree to the deal. We see that this is not really a question of the human right of the ‘Citizens United’ to freedom of assembly; what is involved is their property right to use their money to offer to hire the street for the demonstration. In situations where all the factors involved are owned privately, it is clear that there is no problem or conflict of human rights; on the contrary, only property rights are involved, and there is no vagueness or conflict in deciding who owns what or what is permissible in any particular case. In short, there are no human rights that are separable from property rights. The human right of free speech is only the property right to hire an assembly hall from the owners, to speak to those who are willing to listen, to buy materials and then print leaflets or books and sell them to those who are willing to buy. There is no extra right of free speech beyond the property rights that we can enumerate in any given case. In all seeming cases of human rights, then, the proper course is to find and identify the property rights involved. And this procedure will resolve any apparent conflicts of rights; for property rights are always precise and legally recognizable. Consider the classic case where “freedom of speech” is supposed to be curbed in “the public interest”: Justice Holmes’ famous dictum that there is no right to cry “fire” in a crowded theatre. Holmes and his followers have used this illustration over and over to proclaim the supposed necessity for rights to be relative and tentative rather than absolute and eternal. But let us further analyze this problem. The fellow who brings on a riot by falsely shouting “fire” in a crowded theatre is, necessarily, either the owner of the theatre or a paying patron. If he is the owner, then he has committed fraud on his customers. He has taken their money in exchange for a promise to put on a movie; and now, instead, he disrupts the movie by falsely shouting “fire” and breaking up the performance. He has thus welshed on this contractual obligation, in violation of the property rights of his patrons. Suppose, on the other hand, that the shouter is a patron and not the owner. In that case, he is violating the owner’s property right. As a guest, he has access to the property on certain terms, including an obligation not to violate the owner’s property or disrupt the performance that the owner is putting on for his guests. His malicious act, therefore, violates the property rights of the theatre owner and of all other patrons. If we consider the problem in terms of property rights instead of the vague and woolly human right of free speech, we see that there is no conflict and no necessity of limiting or abridging rights in any way. The rights of the individual are still eternal and absolute; but they are property rights. The fellow who maliciously cries “fire” in a crowded theatre is a criminal, not because his so-called right of free speech must be pragmatically restricted on behalf of the “public good”; he is a criminal because he has clearly and obviously violated the property right of another person – a victim. For a crime to have been committed there has to be a victim who has suffered damage to person and/or property. The axiom is the individual, you. The self is where it all begins and ends. Everything starts and ends with you. The same logic applies to me, and any other individual. If anyone claims otherwise, they’re either lying intentionally to maintain the existing status quo of monopolies or their Stockholm syndrome is kicking in due to constant and repeated exposure to known brainwashing techniques (20 years of public schooling – the monopoly on education/information). It isn’t all that complex, it’s basic economics. If it is intentional, how do the rulers maintain the status quo? Again apply economic laws. The axiom is the free market (the people). The state lies within the free market, it may have fooled you into believing that it is omnipresent and that the market lies within the state (it does not) but in a free market the producer (company) should be answerable and regulated only to and by the consumer (market) this is not the case now with the Statist crony “markets” due to the violent interference of the parasitic monopoly privilege issuing organization known as the State (Government). Even if their violence is solicited, it is nothing more than interference. In the crony Statist “markets”, the producer bypasses the actual market (lousy product quality, sub par services and sky high prices are proof enough as the business would not last long in the free market, free market competition will put them out of business) and instead bribes the Statist-ruler (Government) calling it donations, lobbying etc. The Statist-ruler (Government), who has authority (giveth not to thee but thyself by thyself) grants special privileges to the producer thus ensuring a monopoly. The Statist-ruler (Government) uses force on those who disobey (take intellectual property for example. It should rightly be called intellectual monopoly as property and monopoly are diametrically opposed), and calls it “the law“. So how do we solve this? Vote in more Statist-masters (Government) and grant them more non-existent rights over you? The next candidate is more compassionate perhaps? Even that is flawed logic. If neither you nor me have the right to legislate and dominate other humans, and if neither you nor me have the right to delegate a right we don’t have – how, in the first place, did the Statist-ruler (Government) obtain these rights? The claim that some humans have more rights than others, specifically the right to rule with violence, and that this claim is legitimate is preposterous. I disagree, and I already proved that any entity and/or organization that claims to be “the law” is nothing more than a monopoly on violence; given that law is merely the just use of force.